In a year full of new sci-fi series from Image Comics, writer Chip Zdarsky and artist Kagan McLeod’s Kaptara has stood out by taking a sillier approach, detailing one man’s fantastic journey to an alien world heavily inspired by the ’80s Masters Of The Universe toy line and TV show—specifically, the homoeroticism of the character designs. Trapped on an alien planet full of scantily clad studs, gay astronaut Keith Kanga has found himself thrown into increasingly ludicrous situations over the course of Kaptara’s first arc, becoming closer to the noble soldier Manton along the way. Judging by this preview of next week’s Kaptara #5, Keith’s romantic feelings may be reciprocated, but the two men have bigger problems to deal with, like the imprisonment of their ally Dartor by insect warriors, before working out their affections. Kaptara has had some unfortunate delays in this first arc, but the book has been worth the wait for McLeod’s lush, incredibly imaginative artwork. Working with color assistant Becky Kinzie, McLeod has created a candy-colored sci-fi world full of bold characters, and these pages are just a small taste of McLeod’s skill for memorable character design. (Just wait until the issue’s closing double-page spread.) 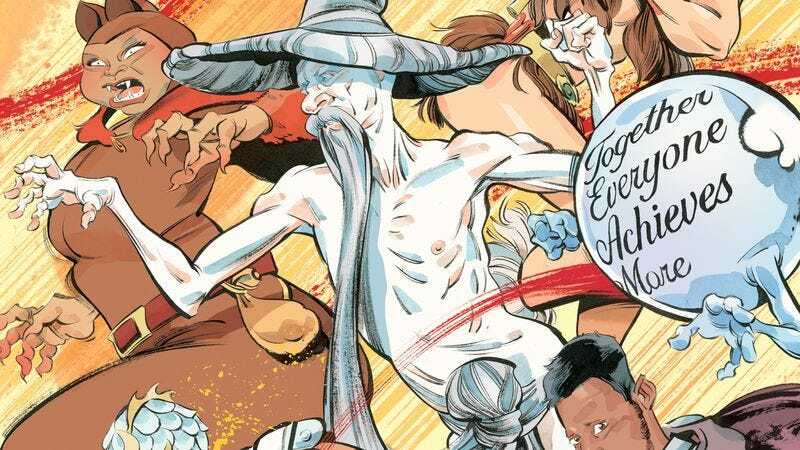 McLeod’s comic timing accentuates the humor of Zdarsky’s irreverent scripts, but also adds weight to the story with nuanced expressions that ground the cast in real emotions. Comedy always comes first in Kaptara, but the stakes are still high for these characters.